In 2005, I came across the remarkable Lesley Pennington, an ex Apple employee who moved from Canada, via Silicon Valley to Sweden. She quickly became bored with the standard colours IKEA offered to her newly bought sofas, so she decided to make some of her own. 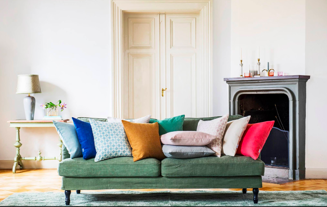 She quickly realised that there are thousands and thousands of IKEA sofas and armchairs in homes across the world, that could bring out everyone’s own personality by adding some design and different colours. Today, BEMZ has sales of over 60MSEK (2015), with customers in most countries where there is an IKEA store! From day one, everything has been digital at BEMZ. Design, production, marketing and sales. One of Swedens earliest, truly digital ecommerce companies. We were fortunate enough to be part of the early stages in BEMZ, and as BEMZ enters the next phase of its journey we sold our shares to Verdane Capital as part of their growth investment into the company in 2015.